Save space in your house with a mini crib by choosing the best one from our list. Have you ever struggled with figuring out how to fit a full-sized crib, as well as all the other baby essentials you will need for your little bundle of joy, into your home? If the answer is yes, then a mini crib might be a good choice for you. Mini cribs are big-time space savers and multitaskers too – they can double as a bassinet, and even transition into a toddler bed as your baby grows. The first on our list is the simple and handy 2 in 1 Portable mini crib from Dream on Me. This crib is very useful if you frequently need to move the crib around the house, take it on a trip, or simply when the crib has to be stored. This crib easily folds flat for simple and fast storage. The crib comes in white, natural, espresso, and cherry colors schemes, fitting any room’s decor. This mini crib also has a 2-position mattress support. This next crib is very attractive and is super easy to assemble. DaVinci Emily 2-in-1 is one of the best mini cribs for smaller nurseries, primarily due to its size. But the main attraction is, of course, the useful twin bed conversion feature – it is a perfect option for children that are around 18 months or older (bed frame sold separately). The compact and solid crib also offers four adjustable and convenient mattress positions, allowing you to adjust the height to accommodate your baby’s size. Included in the affordable price of this convertible mini crib is a 1” waterproof pad. These compact cribs are also healthy for your sweet pea because it is phthalate-free and lead-free. The DaVinci Emily 2-in-1 is also extremely simple to assemble, making it an all-around ideal mini baby crib for compact houses and travel. This cute mini crib is made with 100% pine wood, sourced straight out of New Zealand, ensuring your bundle of joy has a sturdy bed to support him or her. This mini crib also comes with two adjustable mattress positions, allowing you to easily alter the height as your baby grows. This model is available in white and is suitable for both girls and boys. The crib allows for its parts to be repurposed for a twin bed. The crib is compact but big enough to fit in babies as old as two years of age. The DaVinci adheres to safety standards, meeting the ASTM international and the U.S CPSC baby crib safety demands. When you buy this mini crib, you will also receive a 1” waterproof pad. The assembly of this petite crib is amazingly simple, and it comes with a one-year warranty. If you are in the market for a more budget-friendly mini crib, the Kalani mini crib is the one for you. The DaVinci Kalani Mini Crib and Twin Bed is a perfect pick for new parents, as it functions just as well as the more expensive models while saving you from a risky, expensive investment. The Kalani mini crib is low-profile and therefore easy to reach, while the mattress can still be adjusted into two positions. The crib comes with a finish that went through a non-toxic, anti-lead and anti-phthalate multi-step painting process, to help keep your child safe and healthy. The Kalani is easy to set up and it can also be altered to a twin-size bed for later use. A one-inch waterproof pad comes with this mini crib and the crib’s warranty is one year. Beautiful, sensible, as well as comfortable is just a short description of this mini crib. The Addison crib is not only small, lightweight and sturdy, but it also comes with multiple conversion options. The crib can be converted into a daybed once your baby reaches toddler years, as well as the footboard and headboard of a twin-sized bed (bed rails for the full bed sold separately). On top of that, the Addison 4 in 1 features 3 adjustable mattress positions. It also meets ASTM and CPSC standards for health safety. The set-up is a breeze, and it comes in three color options of black, cherry and white. The next item in our list is the Orbelle Tina Mini Crib, a quality product that provides heaps of portability as well as coziness. It can be easily folded to be moved or stored away until it is needed again. This gorgeous crib is crafted from solid wood, which provides excellent sturdiness and durability, and it also comes in 5 different colors – black, white, grey, beige and natural wood. Here is another cool little crib, taking up minimum space, but offering unpatrolled convenience when moving it around. This mini crib is very durable, light, easy to assemble, simple to clean, as well as budget-friendly. The Alpha Mini’s materials and finish are also safe for your baby’s health, as the crib adheres to ASTM and CPSC standards. The crib was designed to be easily switched between wheel-off and wheel-on modes, making this crib very easy to move around the house, as well as changing it into a stationary rocking crib when the wheels are removed. Also, this crib has a plastic cap top on each one of the long rails. This crib is an excellent choice for babies up to one and a half years old. It has four adjustable mattress settings and three height settings. The package also includes a 1” waterproof pad as well as a 1-year warranty for customers. If you are looking for a mini crib for traveling, this one is best for you no matter where you are. In addition to the convenient wheels, the Portable Mini can be folded flat for easy portability and compact storage. This makes it your best choice when traveling with your infant. The best part is that the crib is constructed out of a sturdy yet lightweight wood to keep baby safe and secure, while not compromising the quick and easy portability. This mini crib is made with two adjustable mattress height positions. The Origami Mini Crib is one of the bestselling cribs from Babyletto. This model is perfect for larger families because it takes up very little space in the nursery, and the added wheels make it simple to move around your house. This mini crib can also be folded for easy storage or travel, and it also features two adjustable mattress levels. It has a very firm and seemingly bulky design, yet manages to remain amazingly lightweight. Additionally, for your added peace of mind, the crib is phthalate-free, lead-free and 100% toxin-free. The item is available in three colors – grey, white, and lagoon. Although slightly more expensive than most other mini cribs, the Origami provides everything you’d need from such a crib. Last but not least on our list of best mini cribs is Dream On Me Aden – the counterpart to the previously discussed Addison. The Dream On Me 4 in 1 Aden Convertible Mini Crib is lightweight and small, which makes it easy to move around. The Aden Convertible is also durable while still maintaining its fashionable good looks. It can be put to great use as a daybed for your toddler – or even fill in as parts for a twin bed as needed. For added benefit, the crib also offers adjustable mattress support frames that allow three different positions offering your developing baby unrestricted growth. Mini cribs, as the name suggests, are smaller than standard-size cribs, and some styles even come with wheels for extra mobility. This makes it easier for you to move baby from your room into their own nursery, once they are ready. Some mini crib models can be folded flat to store under a bed or in a closet, which makes them ideal for visiting Grandma or storing the crib at the babysitter’s house. Most little ones can fit into mini cribs until it is time for the transition to a toddler or twin-sized bed. This happens at around two or three years of age. There are some models that convert into toddler daybeds or even a footboard and headboard for a twin bed. However, you usually have to purchase a separate conversion kit to make this transition. If that is what you plan to do, we strongly recommend you buy the conversion kit at the time you purchase the crib, just in case the model you choose gets discontinued. Also, you will need to purchase a mini crib mattress and crib sheets to accompany the smaller-size frame. Most mini cribs come with a one-inch mattress, which can be really flimsy. 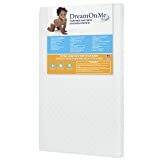 The average crib mattress is 28″ wide and 52″ long, while the average mini crib mattress is only 24″ wide and 38″ long. The importance of safety can never be overstated, especially when dealing with very young children. Hence why we also paid attention to how these mini cribs adhere to safety standards. The ASTM (American Society for Testing and Materials) and CPSC (Consumer Product Safety Commision) are the most influential safety organizations in the US as well as globally. Which is why adhering to the standards tested by these associations is a very big plus to any gadget, toy, or crib you might purchase for your little one. In any case, avoiding lead and phthalate (potentially toxic plastic) content in the materials of a crib is very important. Most of these cribs are very similar in function with minor differences in design. That leaves the mini crib’s price as the main deciding factor for your personal choice. While all of the mini cribs on our list are viable options, the Dream on Me 2 in 1 Portable Folding mini crib provides the most mobility at a very reasonable price. Meanwhile, the Dream on Me Addison and Aden mini crib models provide greater longevity, seeing how they can be converted into other useful furniture for your child going forward. We hope you have found this list of the best mini cribs practical and helpful. These ten ultra-modern cribs are some of the best available today for you and your little one to choose from. After all, a comfortable baby is a happy baby!